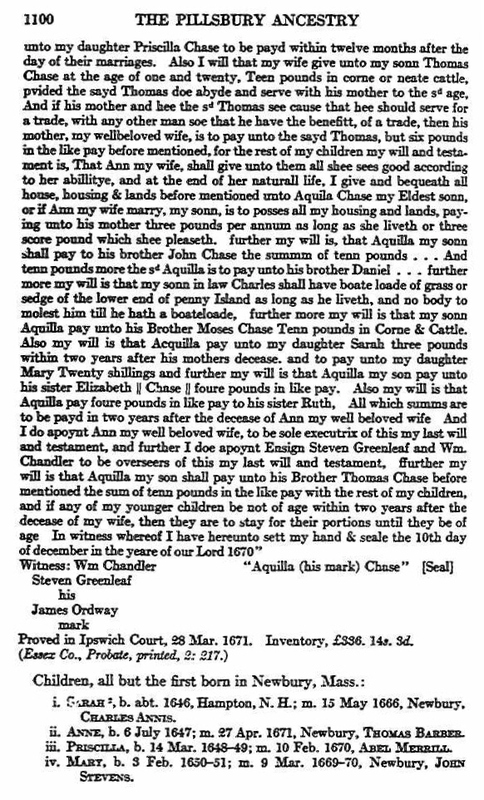 Aquila CHASE (1580 – 1670 ) was Alex’s 13th Great Grandfather; one of 16,384 in this generation of the Shaw line. 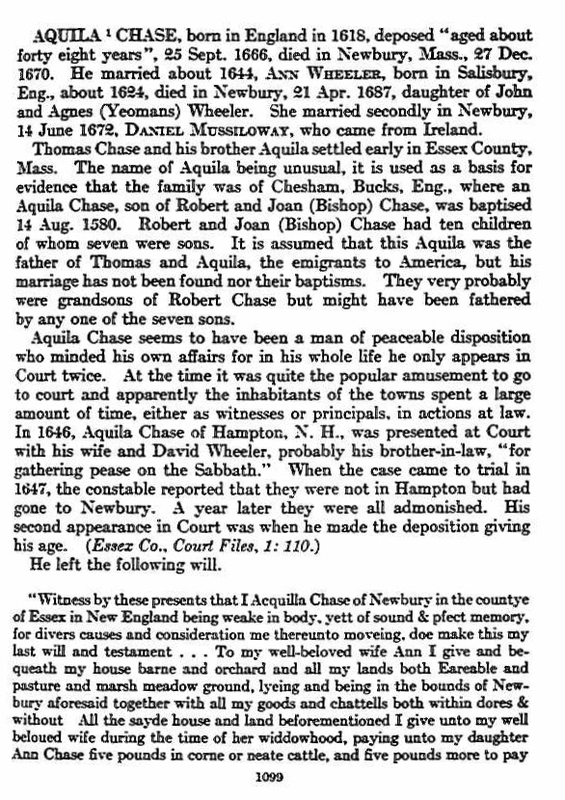 Aquila Chase was born 14 Aug 1580 in Hundrich, Chesham, Buckinghamshire, England. His parents were Richard CHASE and Joan BISHOP. He married Martha (Sarah?) JELLIMAN 11 Jun 1606 in Chesham, Buckinghamshire, England. Aquila was buried on 9 Feb 1643 in St Nicholas Cole, Abby, London, England. Martha Jelliman was born 10 Nov 1588 in Hundrich Chesham, Buckinghamshire, England. Her parents were John JELLIMAN and Margerie [__?__]. Martha died 15 Aug 1643 in Chesham, Buckinghamshire, England. She was buried on 15 Aug 1643 in St.Nicholas, Coleabby, Chesham, Bucks, England. 1. William CHASE ? 4 Jan 1607 Hundrick Parish, Chesham, Buckingham, England Mary TOWNLEY before 1621 in England. May 1659 Yarmouth, Plymouth Colony. It hasn’t been proven that Aquila was the father of immigrants Aquila, Thomas and William Chase. Even if it their descent can’t be proven, I think it’s likely they were related. Perhaps the immigrants were Aquila’s nephews rather than sons. Aquila and Martha lived in St. Thomas-the Apostle until 1611, when they moved to the parish of St. Nicholas, Cole Abbey, in London, where Aquila was known as a merchant and tailor. Their children, born on Knight Rider’s street in London were, Anne, Martha, Sara, Elizabeth, Joane, and Aquila Jr.. Martha was buried in St. Nicholas on August 15, 1643 and Aquila was buried February 9, 1643, also in the parish of St. Nicholas, Cole Abbey, London. With The exception of Aquila II, all of Aquila and Martha’s children died at a young age. Martha was born and died on 11 March 1610, presumably stillborn. Anne lived for only 2 years, from 26 Feb 1607 until 19 July 1609. Jane, born in 1623 (no month or day known) and Sara, born 9 Feb 1611 Both died on 17 Aug 1624. The cause of their deaths are unknown. 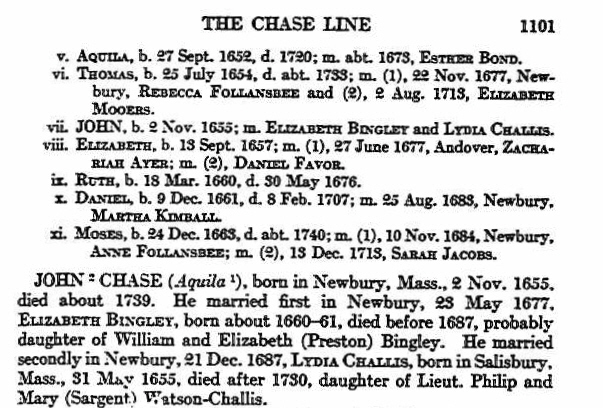 In reviewing the evidence, I don’t think William Chase’s English birth or parents is really known. I’ve updated to show four competing theories, none of which really has strong evidence. Thomas’ wife Elizabeth Philbrick was born 1618 in England. Her parents were Thomas Philbrick and Elizabeth Knapp. After Thomas died, she married John Garland. She finally married Henry Robie 19 Jan 1674 in Hampton, New Hampshire.Elizabeth died 11 Feb 1677 in Hampton, New Hampshire. John Garland was born in 1622. His parents were Peter Garland and Elizabeth [__?__] John died 4 Jan 1672 in Hampton, Rockingham, New Hampshire. Henry Robie was born in 12 Feb 1618 in Castle Donington, Leicestershire, England. His parents were Thomas Robye and Mary Coxon. 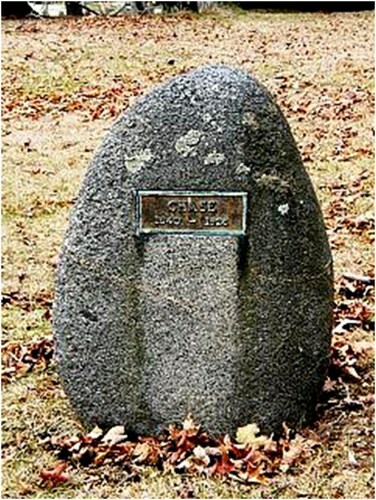 He first married 1645 in Hampton, Rockingham, New Hampshire to Ruth Gilman ( b. 1621 in Newmarket Rockingham, New Hampshire; d. 5 May 1673 in Hampton, Rockingham, New Hampshire) Henry died 22 Apr 1688 in Hampton, Rockingham, New Hampshire. Thomas was one of the first founders of Hampstead, Province of New Hampshire, now Rockingham County in 1639 with his brother Aquila. Thomas Chase was born possibly in Willesden Parish, Londonor Cromwell Parish, Nottingham. He died intestate in 1652. 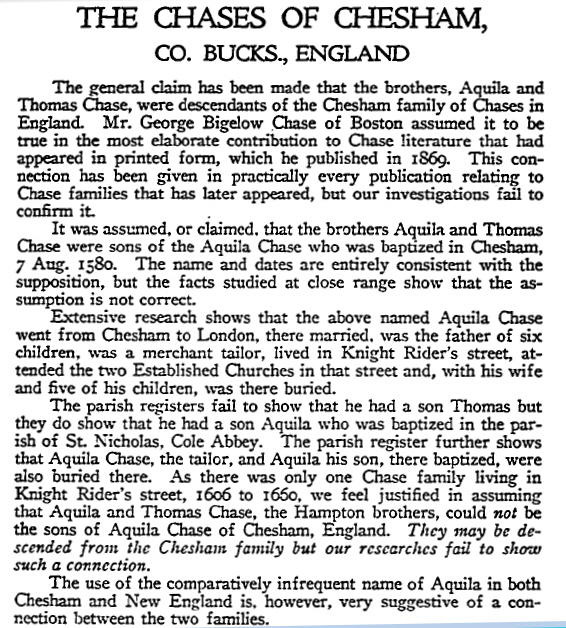 Early genealogical histories of the family indicate that Thomas and Aquila came from Cornwall, England. It is believed that they were employed by an uncle named Thomas Chase, who was part owner of a ship named “John & Francis” and that they learned to become navigators. Thomas’ brother, Aquila, was granted land in Hamptonon the condition that he go to sea and service the town for four years. This would tend to verify the above theory and would explain why they were found on the coast rather than in their original area of birth. The settlement of Hampton, New Hampshire Began on October 14, 1638, under the leadership of Rev. Stephen BACHILLER. By the first part of 1639 another group arrived with Timothy DALTON, who became the associate pastor of the Hampton Church. It is probable that Thomas and Aquila were with this second group, as by 1640 immigrations had slowed considerably. We know that Thomas, at least, was in the second group as he is mentioned in a list of families that came to Hampton that second summer. In June of 1640 small grants were made to a number of people including Aquila and Thomas Chase. These grants were for six-acre house lots. Aquila later acquired six acres of upland meadow and swamp, which was sold to his brother, Thomas, when he moved to Newbury, now located in the present state of Massachusetts. In fact, it was his acknowledgement in court of the sale of all his land in Hampton, except a dwelling and one and one-half acre, to his brother, Thomas Chase of Hampton. The main road going horizontally across the top of the map then, at right, angling down to the right corner, is today’s Winnacunnet Road. At the bottom right corner it leads “To The Sea”. Today’s Lafayette Road/Route One starts in the top left and goes vertically down (south) into the thicker road, then about 2/3 of the way down angles sharply off to the left corner in the small road reading “To Salisbury”. That road today is pretty much straight as an arrow north to south. Midway down that same road a small road angles off to the left that reads “To Drake Side”. That is today’s Drakeside Road. The fat road leading from the point where Route One angles off “To Salisbury” to the right and its meeting with Winnacunnet Road, is today’s Park Ave. The two roads leading off the bottom of the map both say “To the Landing”, and at the time were both ends of a single road that went in a loop. Today they are still there, called Landing Road, but are cut off in the middle by a new highway. Lastly the small road in the top right is Mill Road. of land near it was called The Meeting House Green and included all of what ws later know as the Ring Swamp, along the road around it. A common-way was laid along the eastern edge and later became the main road to the seashore. Around the green and along the common-way many homes were built, some of which are still inhabitated by descendants of the original owners. Aquila’s wife Ann Wheeler was born 20 Dec 1629 in Salisbury, Wiltshire, England. Her parents were John Wheeler and Agnes Yeoman. Ann died 21 Apr 1687 in Newbury, Essex, Mass. Aquila Chase first appears at Hampton, New Hampshire. A company under the leadership of Rev. Stephen BACHILER is supposed to have commenced the Settlement on 14 Oct. 1638. 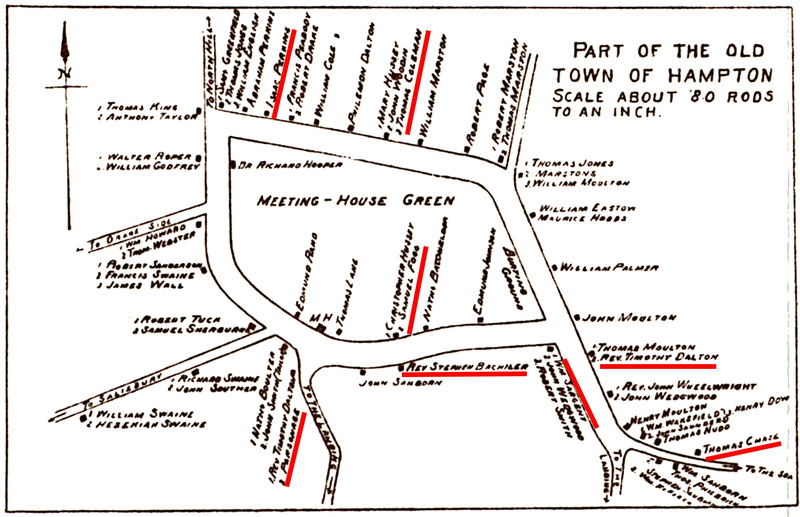 (Dow’s History of Hampton).Early in the year of 1639,a new band of settlers came with Rev. Timothy DALTON, who became associate pastor of the Hampton church. The town was incorporated by the General Court of the Massachusetts Bay Colony 22 May 1639. It is probable that Aquila and Thomas Chase came with the second company as it appears that emigration was greatly diminished by the year 1640. The Hampton records show that in the year 1640, there was granted to Aquila Chase six acres for a house lot. In 1644 an additional grant was recorded of six acres of “upland meadow and swamp”, which he sold to his brother, Thomas, on his removal to Newbury. Before he removed to Newbury, he was seen gathering peas on the first day of the week and at the Quarterly Court held at Ipswich, 29 Sept. 1646, he and his wife, and David Wheeler, his brother-in- law, all of Hampton,were presented for gathering peas on the Sabbath. One handed down tradition states that Aquila and David were returning home from a bountiful fishing day, upon their arrival, Ann proceded to the garden and prepare a meal celebrating their catch. It came to pass that they were caught and were supposed to be punished for their act. Other records recently found state that Aquila Chase came over from England on the Mary and John in 1630 but fails to mention his brother on that specific voyage. Aquila was one of the first founders of Hampstead, Province of New Hampshire, now Rockingham County in 1639 with his brother Thomas. This entry was posted in Line - Shaw and tagged Father of Immigrating Brothers, Hampton Pioneer. Bookmark the permalink. Coat of Arms removed, at the time Aquila Chase was not part of the gentry and he did not have a coat of arms when his children came to America. I love your website and respect your research. However, I do not think you can justify keeping Aquilla 1580 even as a suggested parent of the 2 brothers. I would separate them out and publish them with the wonderful notes you have to justify the separation. Your genealogy and the respect of it would be served better for the bold step I believe you and I should take here.